Lynn George, GW’s first-ever director of women’s athletics, died Oct. 1 at 89 years old. Lynn George was a fearless advocate for gender equality in collegiate athletics and an energizing spirit for GW’s student athletes, former colleagues and athletes said. George, GW’s first-ever director of women’s athletics, died Oct. 1. She was 89 years old. She was preceded in death by her husband, James George, and is survived by her son, Robert, and two granchildren who live in Bethesda, Md. George was born and raised in D.C. and attended Eastern High School in the Lincoln Park neighborhood. She earned both undergraduate and graduate degrees from GW, graduating with a master’s in education in 1952. After earning her master’s degree, George became a professor in the department of human studies and kinetics, a position she held for almost 24 years. 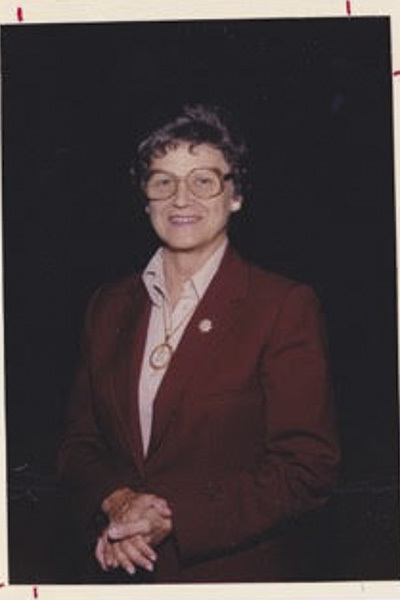 In 1975, George was appointed as the director of women’s athletics where she served until her retirement in 1987. As director, George helped to grow women’s athletics at GW – expanding it from a small local program into the prominent NCAA Division 1 presence it has today. George was passionate about athletics from her start at GW: As an undergraduate student, she was an active student athlete and starred in four sports: basketball, softball, rifle and tennis. George’s efforts were recognized in 1990 when she became the first woman to gain membership into the GW Athletics Hall of Fame. Tanya Vogel, senior associate athletic director at GW, said she will remember George as the “foremother” of women’s athletics – the person who pushed to start more women’s teams. Vogel played on the women’s soccer team in 1992 during Warner’s time as the women’s athletics director. Warner introduced Vogel to her mentor, George, who was a season-ticket holder and attended many of the women’s soccer team’s games. Vogel said George remained an energizing presence for student athletes, even after her retirement. Honey Nashman, a colleague of George’s and the namesake of the Honey W. Nashman Center for Civic Engagement and Public Service, noted George’s attention to academics and her compassion. Nashman said George’s most significant contributions were her tireless efforts in advocating for and supporting Title IX rights for female student athletes. Today, an award named in her honor – called the Lynn George Outstanding Senior Female Student Athlete – is given annually to a women’s senior athlete who exemplifies excellence in athletics, academics and citizenship. Jeannie Dahnk, a four-year (’78–81) diver and swimmer and a GW Hall of Fame Inductee (‘98), remembers George challenged athletes to become well-rounded students and players, pushing them to succeed the classroom and on the court.